Corey Smith has announced that he will launch his inaugural headlining west coast tour run this fall in support of his newest release, While The Gettin’ Is Good. Corey’s “West Bound and Down” fall 2016 tour dates will feature stops at Tractor Tavern in Seattle, September 28, Great American Music Hall in San Francisco on October 4, and The Mint in Los Angeles, October 6. Other dates of note on the tour include Grizzly Rose in Denver, September 23, Aladdin Theater in Portland on September 23 and The State Room in Salt Lake City, September 24. A full list of dates is included below. 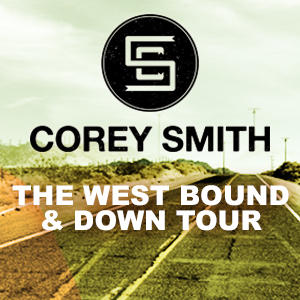 Beginning on Friday his tour will also give fans the opportunity to enter to win a VIP Tour Pass on CoreySmith.com. The VIP Tour Pass will get one lucky winner and a friend tickets to every show on the West Coast Run. Fans can also download images with their specific city to share on their social media, change out their profile photos, share with friends & family, and more.